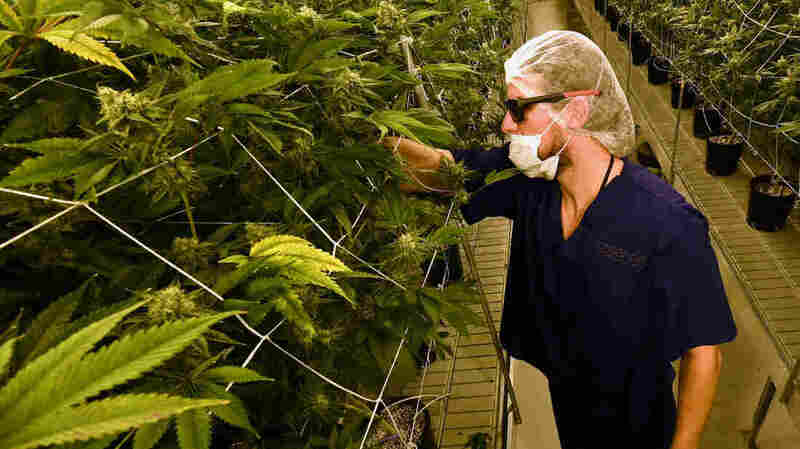 Marijuana Shortage Prompts Emergency In Nevada; Tax Officials Weigh Changes : The Two-Way After a booming first week of legal retail sales, Gov. Brian Sandoval endorsed a statement of emergency and regulators are looking to boost distribution. A man tends to marijuana plants at a 54,000-square-foot marijuana cultivation facility in Las Vegas. In Nevada's first weekend of recreational pot sales, "well over 40,000 retail transactions" were carried out, tax officials say. "Right now, only companies that are also licensed to distribute liquor in Nevada are able to bring marijuana to dispensaries," Nevada Public Radio's Casey Morell reports for NPR's Newscast unit. "The dispensaries say that's why they're running out of the drug." Nevada opened the retail pot market on July 1. The state has 47 licensed stores, and in the first weekend of sales, "well over 40,000 retail transactions" were carried out, tax officials say. Some retailers said they racked up twice as many sales as they had estimated — and they also reported a dire need for new deliveries to restock their shelves. At least seven wholesale liquor dealers have applied to become marijuana distributors — but the tax department has said that as of July 5, "no wholesale liquor dealer has met the application requirements to receive a marijuana distributor license." The situation has left some stores "running on fumes," Nevada Dispensary Association President Andrew Jolley told the Associated Press on Tuesday. Nevada tax officials expect pot sales to generate $100 million in revenue over the next two years. In the agency's statement of emergency, the Taxation Department's executive director, Deonne Contine, said changes are needed both to prevent marijuana customers from reverting to the black market and to support the new businesses that have sprung up around legal recreational sales, opening shops and hiring workers. "Unless the issue with distributor licensing is resolved quickly, the inability to deliver product to the retail stores will result in many of these employees losing their jobs and will cause this nascent industry to grind to a halt," Contine wrote, in a statement that was endorsed by Sandoval.